You don’t have to be really crafty to put together a special birthday party. So many of us are busy taking care of our families that we don’t have a lot of extra time (or money) for planning the perfect party. There are so many quick and easy birthday party ideas that you can use to make the day special. Save yourself time by purchasing a cake or cupcakes from the bakery. It is more expensive than making your own cake or cupcakes, but if you’re pinched for time this is a real time saver. Buy a boxed cake mix, a jar of icing and various candies so that the little guests can decorate their own baked cupcakes at the party. Little ones always love playing with their food! Rent a party location that does all the party food, decorating, activities and cleanup for you. These places organize so many birthday parties each week that they have it down to an organized process. 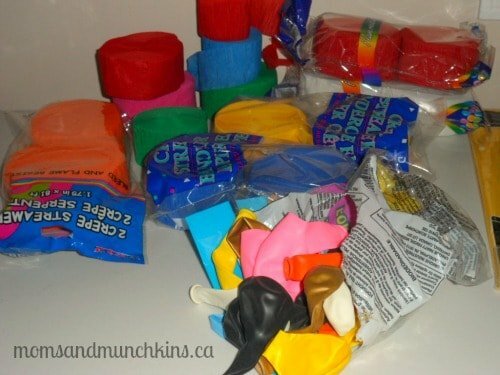 Placing inflated balloons on the floor is a quick way to decorate and the kids will love playing with all the balloons. Sending your party invitations electronically saves time labeling envelopes, going to the mailbox and buying stamps. Crepe streamer paper is really inexpensive and easy to work with. Here are some fun ways to create inexpensive party backdrops. To save yourself time in the kitchen, order in food like pizza. Your local dollar store will have plenty of easy birthday party ideas for favor bags like stickers, stamps, crayons, temporary tattoos, etc. A fun party idea during a warm season is to plan a birthday picnic in the park and bring along some sport equipment for the kids to play with. Just remember, it’s all about making the birthday boy or girl feel special and you don’t have to spend a lot of money to do that. Any party spent surrounded by family & friends that care about you is a good one! What are your best tips for planning easy birthday party ideas? Stay updated on our latest ideas for parties and family fun by following along on Facebook, Twitter, Pinterest and Bloglovin’. Easy is the way to go! The way to make a birthday party perfect for children is to cater to their specific likes and dreams with the games and decor! So a fairy theme or princess theme is great for the little girl that loves those things, and so on. Once you find the right theme, the next step is decor and games! I have found some great, fun games and have loved the response from the kids!